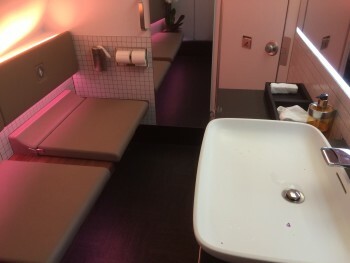 My review of the Qatar Airways First Class BUS! 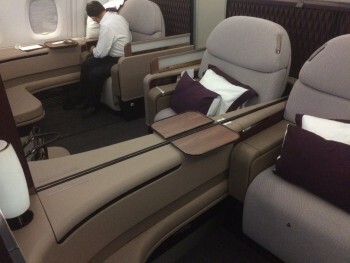 This article is my review of the Qatar Airways A380 First Class seat and service..
At the time I booked, Qatar Airways was not releasing Avios seats on the A380 in First Class to London. There was plenty of availability to Paris, however, so I booked myself onto the early morning Doha to Paris service. I booked a separate connecting flight to London using a Reward Flight Saver British Airways redemption. The cost from Doha to Paris was 60,000 Avios plus £119 of tax. The connection from Paris, in Club Europe, was 9,000 Avios plus £25. I didn’t realise at the time that this would involve a change of terminals in Paris …. It is not clear how committed Qatar is to First Class. The Boeing 787 and Airbus A350 fleets on order do not come with a First Class cabin. The airline was clear that it felt it had an exceptionally good business class product – something most HFP readers who have tried it would agree – and did not need First Class. First Class is at the front of the upper deck. Business Class sits directly behind. 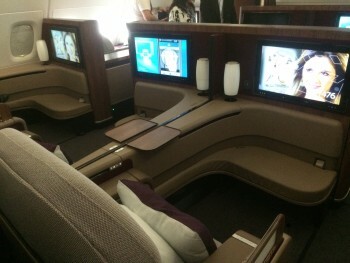 I will be testing out the Qatar Airways A380 Business Class seat in March and will be reviewing it on HFP. Interestingly, there is also a block of Economy seats at the back of the upper deck. I’m not sure how they stop customers from those seats accessing the bar, of which more later. Compared to the Etihad First Class Apartment, of course, this is nothing to write home about. Let’s be honest – only the Singapore Airlines First Class Suite comes close to what Etihad is now doing. If you have the choice of Qatar or Etihad in First Class then (as long as you are guaranteed the Etihad A380) you would be crazy not to try it. Privacy is OK but obviously limited. There is, a la British Airways Club World, a partition which can be raised to separate you from your neighbour in the middle seats. In the window seats, there is a partition on the aisle which allows you to sleep without being seen by the person across the aisle. It is comfier than the Etihad apartment, however. The seat there is simply not designed for ‘putting your feet up’. It is fine for sitting, it is fine for sleeping (as you open out your bed) but for relaxing I was not too impressed. The Qatar seat, on the other hand, worked perfectly. The bathroom is impressive. As Qatar does not have showers, you have a very large bathroom indeed. The toilet is under the leather pad at the top left in this photo. It is a bit disconcerting when you first walk in because you can’t see it! …. 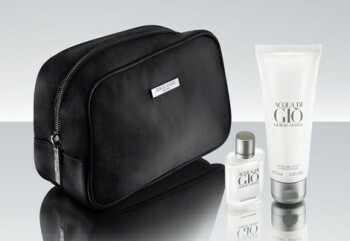 but I actually got the main ‘Armani’ line and not ‘Acqua Di Gio’. It was a 20ml or 30ml bottle. I think these are good branding exercises for the airlines – I was using the shower gel at home for a few weeks and it always reminded me of the flight when I picked it up. 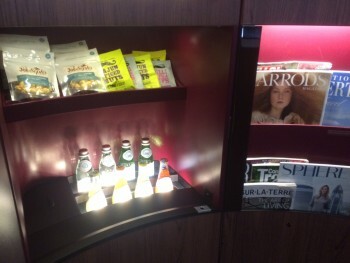 Click here for Part 2 of this review where I look at the A380 onboard bar and the Qatar First Class food and drink offering. Qatar Airways has a special section of its website devoted to the A380 which you can find here. and regarding the F-ground service. QR F-pax won’t get it in CDG,BKK or LHR. Only in DOH as transit pax. A Al Maha Service employee will wait for you, head directly to the elevator and bring you directly to the Al Safwa Lounge. Before Al Safwa opened one had quite a walk and clear security. Now from deboarding until arriving in the lounge max 5 min. Forgot to ask, do BA CS charge you to make this type of bookings via the phone as I’m sure I read somewhere they don’t as their IT cannot do this booking online but good to hear from experience. My booking for this years holiday was with Avios.com and they didn’t charge me for phoning – I think if you can’t do it online and have to call they don’t charge. I’ve called BA and told them something is not working online and not been charged, they will try but if you say I tried online and it didn’t work they wave it. Thanks, I wouldn’t normally bother but I’m sure taxes are lower as I’m starting in Newquay connecting in London the same day. No APD on some routes from Newquay – including any long haul connection. Do you know why avios do not pass on the savings but ba avios do? Always ask for the phone fee to be waived as a couple of naughty CS reps have just quoted one amount for tax recently – that included the telephone booking fee without saying. Unfortunately I only spotted it on the second occasion, phoned up to have to removed, and when I explained it had not been made explicit and it was a booking that could not be made online, that part of the “taxes” was refunded immediately. Is it only the apd on the newquay return leg that we save on, just done another dummy booking using Avios and yes no apd on the newquay part but I’m sure I managed to get the ba avios redemption section to work a few months back on this combination and it reduced the whole taxes by as much as £240 but would of needed to add suitcase charges on the flybe part through ba. Does this sound right the reduction in taxes? Are you sure 60000 avios for First?? ?you cant get even first on BA off peak for this amount of avios. Yes, 85,000 for first for us off peak. Any idea why avios do not take off the APD on the newquay route, my mistake with the figures and they do add apd on the whole combination flights for taxes with connecting flights at gat. My return flights do go into the following day, would this screw up the connections for apd purposes? I think I’d phone them Tilly71. APD is not recalculated unless you exceed 23 hrs 59 minutes at the transfer point, till then it’s a transfer and not a stopover. It may be something as simple as the IT system not being able to recognise it’s the following day but still within 24hrs. 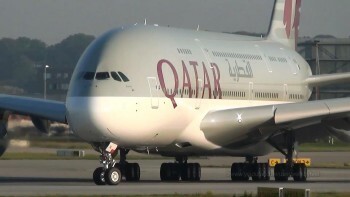 I flew Qatar Business Class last year on the A380 to the Far East and to be frank thought it was fantastic. I’ve flown most airlines to the Far East from the UK and thought that Qatar airlines was head and shoulders above them all. I’m top tier One World so entitled to go into First Class lounges; in Doha there was not a first class but they did tell me there were going to open one at some point.